This article was first published in the Summer 2015 issue of Barnsley CAMRA's magazine The BAR. 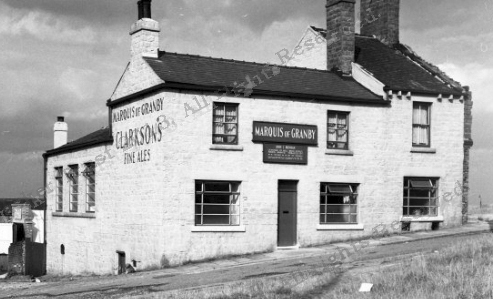 Not so long ago there were parts of Barnsley with a pub on every corner, but now most of them have been swept away by redevelopment, or in the case of the Marquis of Granby, for a car park. According to a map available on YOCOCO, Barnsley Council’s own online digital archive, this pub and the Earl of Strafford across the road, both survived the clearance of most of the surrounding houses for a short while. Compare this with the map on the right, which shows the same area in 1889. There are not just houses lining the streets, but also in courts between the streets. This densely packed part of Barnsley was known as Wilson’s Piece, after the owner of a local linen mill who owned the land and who had many of the houses built at the end of the 18th century. This photo from the Tasker Trust website shows the Marquis of Granby standing amid a sea of rubble, alone near the top of Thomas Street. Even the junction of this road with Heelis Street no longer exists, the road now turns into what’s left of Burleigh Street in a smooth curve just below where the pub stood. My interest in the pub was caught when I found the records for two soldiers who lost their lives in the First World War who were both connected to the pub. 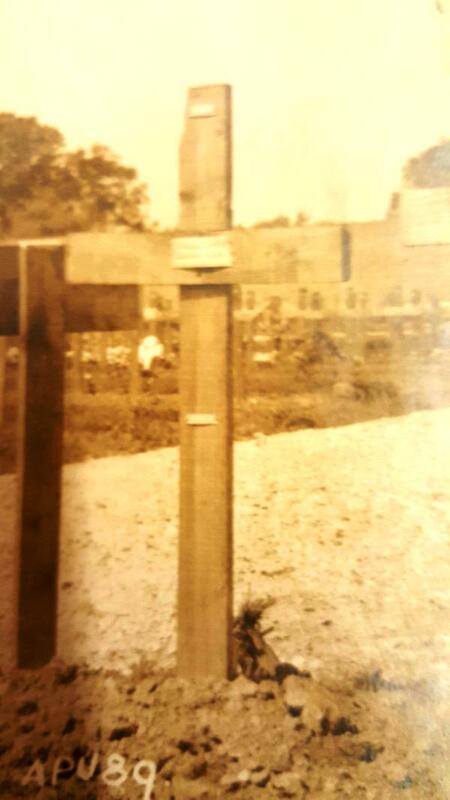 Joseph Swift, aged 30, of the Rifle Brigade was reported missing in May 1918. At the end of the war he was still presumed missing and this fact is noted against his name in the list of Absent Voters for Barnsley’s first post war election due to be held in December 1918. Earlier in the year the vote had been given for the first to every man over 21 and some women over 30 and the names of over 6,000 men and 4 women who were expected to still be absent from home, mostly on war service, are listed in this source at Barnsley Archives and on the Barnsley War Memorials Project website. Joseph’s father, another Joseph Swift, was the publican at the Marquis of Granby from 1881 to 1917 but he also worked as a blacksmith, suggesting that the pub was mostly run by his wife, Mary Ann (née Nixon). Joseph and Mary Ann had seven sons in all. In a move we might find strange today after their sixth, a boy named Ernest, died at 6 months they named their seventh child who was born the following year after his dead brother. All of their children, including Joseph in November 1883, were baptised at nearby St John’s Church and the latter four were probably born in the pub itself. The younger Joseph married Agnes Marshall in the same church in 1905 and had, by the time his name is recorded in the Electoral Register, moved a short distance away to Silver Street. Joseph and Agnes had one child who survived, a daughter named Mary Ann after her grandmother. The Swift’s eldest son, George, who was nine years older than Joseph the soldier, took over the pub from his father in 1917 and kept it until 1936. He also worked as an Engineer’s Pattern Maker at an Iron Foundry. In October 1918 the new landlady of the Marquis of Granby, Mrs Swift, advertises in the Barnsley Chronicle (available to browse digitally and on microfilm at Barnsley Archives) for a General Servant. This suggests that she needed a bit of help with running the pub while her husband continued to work in his own trade. Unfortunately the family’s troubles in the war were not over. New landlord George Swift and his wife Eva also suffered a loss. The report in the Barnsley Chronicle on 7 December 1918 tells us that, “Signaller George Swift, 13th Y & L, whose home was with his parents, Mr and Mrs Swift, of the Marquis of Granby Inn, Barnsley, has died of broncho-pneumonia at the age of 20 years in Aubengue Hospital, France, where he has been visited by his parents. The deceased, before enlisting in July of last year, worked at Messrs Qualter and Smith’s foundry, Summer Lane.” In the same edition of the newspaper is a poignant message addressed to Signaller G. Swift from a Kittie Brown, “The evening star shines o’er the grave, Of one we loved, but could not save.” Could this have been young George’s sweetheart? At least George’s parents were able to visit him. The fact that Joseph was still noted as missing in the Absent Voters’ List suggests that there was still some doubt as to whether he was alive or dead. This may be why his name was not included in the 140 recorded on the memorial which was dedicated in St John’s Church in September 1921. Oddly, though, neither was young George. You would have thought a family with such a close and long connection to the area, and a proven link to the church by baptisms and marriages, would have asked for their men to be included. I suppose we will never know why they were not. Soldier Joseph Swift’s widow Agnes remarries towards the end of 1921, so presumably official notification had reached the family by then. Her married name, Connor, is mentioned along with Joseph’s parents on his Commonwealth War Graves Commission entry which tells us that he is remembered on the Soissons Memorial in France confirming that he has no known grave. After George Swift left the Marquis of Granby in 1936 he was followed by eight more landlords according to the Tasker Trust website, which gives the name of every landlord from 1830, when presumably the pub first opened, right up to its closure in 1969. However none equalled the Swift family who, in a tenure spanning two generations, ran the pub for 55 years. After the publication of this article Barnsley Archives co-coincidently received a donation of some papers from the Swift family. These included a photo of George Swift junior's original wooden grave marker in Terlincthun British Cemetery, Wimille, France. Photos like this were sent to families on request by the Imperial War Graves Commission, the forerunner of today's Commonwealth War Graves Commission.